If you are planning to raise money online for a fundraiser, it is important to use a host that will not charge you a lot of fees. For example, Jeff and Hope Bash, the hosts of the Save Willa’s House online fundraising campaign, turned to DonationTo because this enabled them to avoid paying any credit card fees, and they were also able to keep 100 percent of the money that was donated. By making this decision, they were able to generate more than their goal, and this made it possible for Willa to keep the house that she has lived in since 1979. Even if you are still learning how to fundraise, it is easy to understand how helpful the media can be. Therefore, it is no surprise that the article that the Huffington Post ran about this fundraiser helped the hosts raise money online more easily. 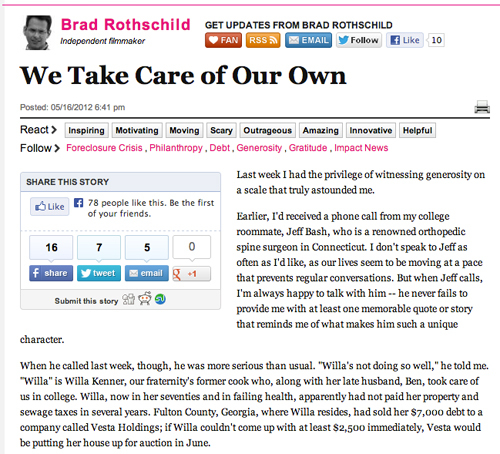 The writer of the article, Brad Rothschild, has a personal connection to Willa. Approximately 20 years ago, Willa and her husband, Ben, served as cooks for Rothschild’s fraternity at Emory University. The positive impact that the couple had on several of the students was still being felt when they found out that Willa was in danger of losing her home. Within moments, they decided that they would need to launch at least one of their fundraising ideas to help out, and this led them to DonationTo. One of the best ways to encourage people to donate online is to use a website that can process multiple payments methods without charging fees. 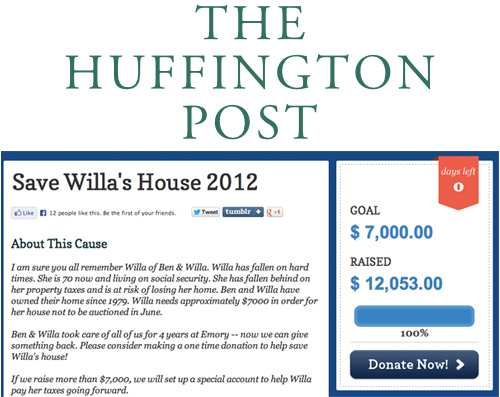 DonationTo enables donors to pay via PayPal or WePay from any web enabled device, and this was definitely a factor in success of the Save Willa’s House fundraiser. Raising money for a worthy cause does not need to be a difficult process. As long as you partner up with a website that makes it easy for everyone to donate online, you should begin receiving donations very quickly. With DonationTo, you can avoid paying any credit card fees, and you will also receive 100 percent of the money that is donated. The Save Willa’s House fundraiser was able to greatly benefit by using DonationTo, and it enabled them to exceed their goal. Fortunately, Willa was able to keep her house, and she also has a nice nest egg to ensure that she does not get into financial problems in the future. With the help of online media you can crowd fund with no additional or special skills. Our donation website is the place where donations from crowdfunding are kept 100%.